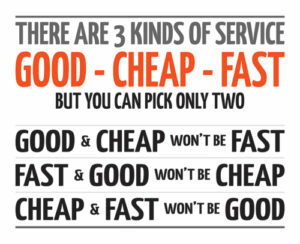 There is an old saying that when it comes to provision of service or goods, you can only have two of these three: cheap, good, fast. If you’re being offered all three by a supplier, be wary. Remember that the cost of sorting out a problem caused by suppliers cutting corners can often be higher than that of the initial order in both financial terms as well as your time to sort it out; not to mention how situations can reflect on you or your marketing team. If a supplier isn’t offering rock-bottom prices, look out for the added-value services they may include within the price like samples, creative services and dedicated account management.